An overview of the SDK, the object model, and how to initialize and connect to a Lync 2013 or Skype for Business server using the SDK. We look at how to authenticate to the server, with code and a live demonstration. Creating a new conversation, adding one or more participants (contacts), and displaying both their audio and video capabilities. Creating a new audio call with existing participants, and managing an audio call request from an existing participant. Adding additional functionality to an audio call, such as DTMF tones (great for interacting with IVRs), placing the call on hold and muting a participant. Adding video, embedded into a web browser, into an existing call, both initiating and accepting requests. 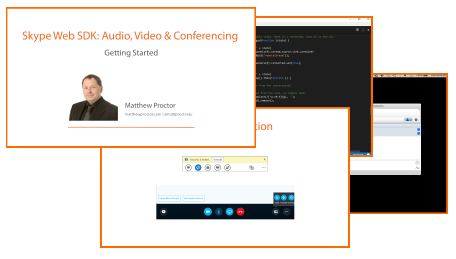 In this module, we’ll take a look at a few troubleshooting tips and useful techniques for ensuring your Skype Web SDK website or application works seamlessly. Learn how to correctly close a Conversation and log the current user out of Skype for Business.